Having limited freedom as a teenage girl in India in the 1970s, she found solace in the world of drawing, painting and poetry. After spending two years at the prestigious Art College of India, disillusioned in love and thirsting for freedom, she left India to travel - a journey which has taken her through adventures and periods of work in the USA, East Africa, Denmark and UK, equipping her with a kaleidoscope of experiences and images which have been interwoven into the subject matter of her art. 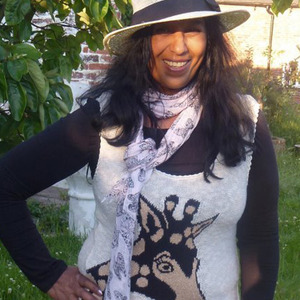 Seema Gill is not only accomplished painter but also an award winning poet and her debut novel “Svera Jang” had been nominated for 2010 East Midlands book of the year. Her paintings evoke the joys and struggles of life in vivid colour, patterning, fluid interweaving subject matter and spiritual growth. Two words sum up her work - versatility and life. The former is reflected in the range of art-forms in which she expresses herself, the diversity of cultural contexts in which she is able to operate, and of the media to which she seems able to turn her hand with ease. 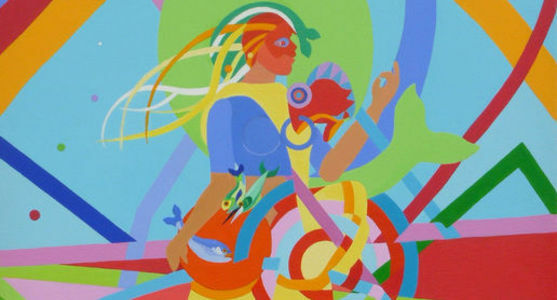 The latter appears in her exuberant imagery, bold and yet gently colorful paintings, filled with the intertwining forms of humans, animals, birds, fishes and insects whose joyous dance draws in the viewers so that they too become a part of the dance. "Spoken in colour, the art of a poet." Earthday Exhibition of paintings with 2 other London artists 22nd and 23rd at St Peter's Church Gallery.